Now is your chance! 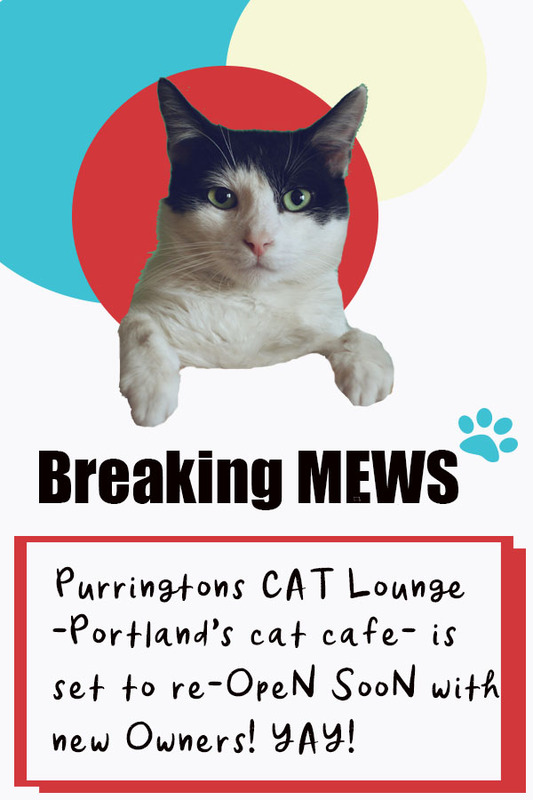 The owners of Portland’s Purringtons Cat Lounge have announced their intention to sell their popular cat cafe. 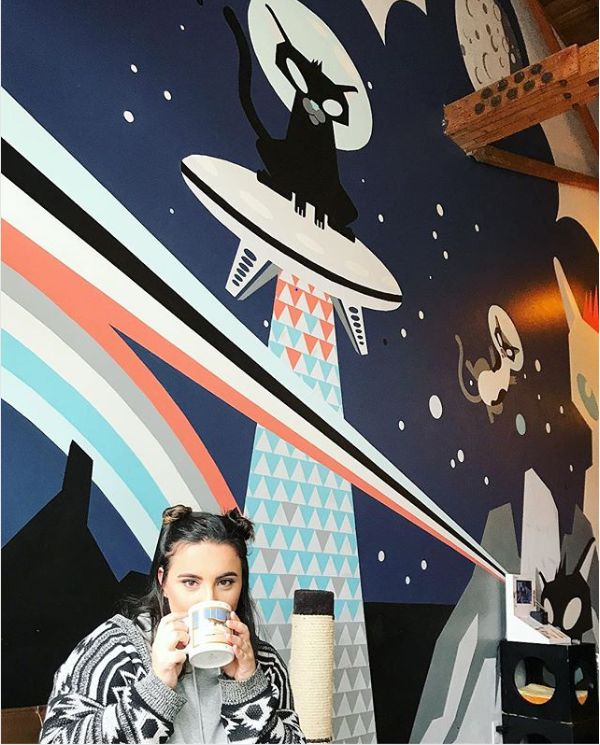 As the first cat cafe to open in the Pacific Northwest, Purringtons has been a leader in the rapidly expanding U.S. cat cafe industry. Wait, there’s a cat cafe industry? That’s right, the number of cat cafes in the United States has risen over 20% in 2018 alone, with over three quarters of states home to at least one cafe. And growth shows little sign of slowing as a number of cafes are set to open soon. So maybe you’re thinking: “Cat cafe! I dunno what it is, but I want one..” Here in the U.S., the cat cafe concept is tied to the mission of finding homes for adoptable cats; rather than the resident cat model that found in many parts of the world. U.S. cafes typically partner with local animal rescue groups to help find homes for adoptable cats. The concept is really two businesses: cafe and cat adoption. Beyond that, cat cafes have many interpretations. You’ll find full service cafes, cool co-working cafes, and even a video arcade. -All with fabulous adoptable cats! 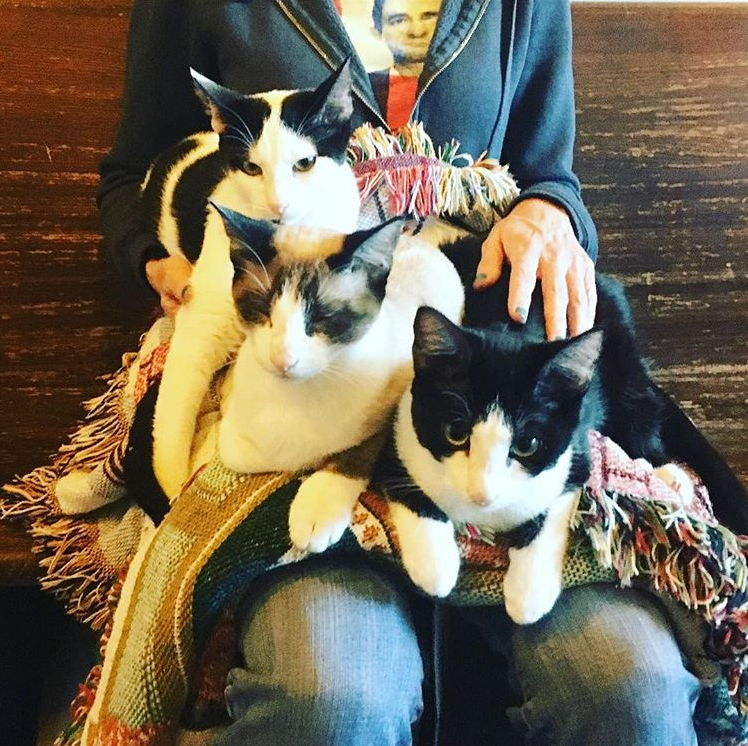 In just three short years, Purringtons has become a hub for the vibrant Portland cat community. Oregon itself is one of the top ten cat ownership states in the country, with over 40% of citizens owning a cat, according to the U.S. Pet Ownership & Demographics Sourcebook. 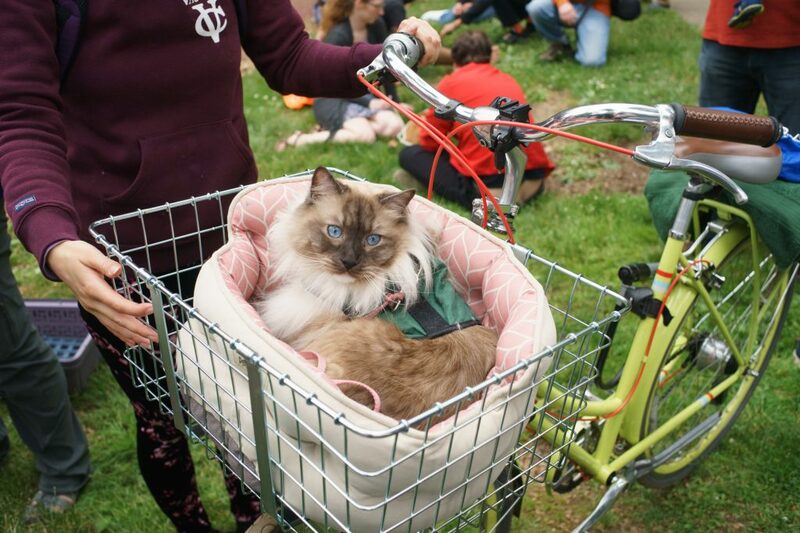 Portland is a leader in the First Caturday movement, the monthly feline version of a dog park. And Purringtons is at the heart of it all. 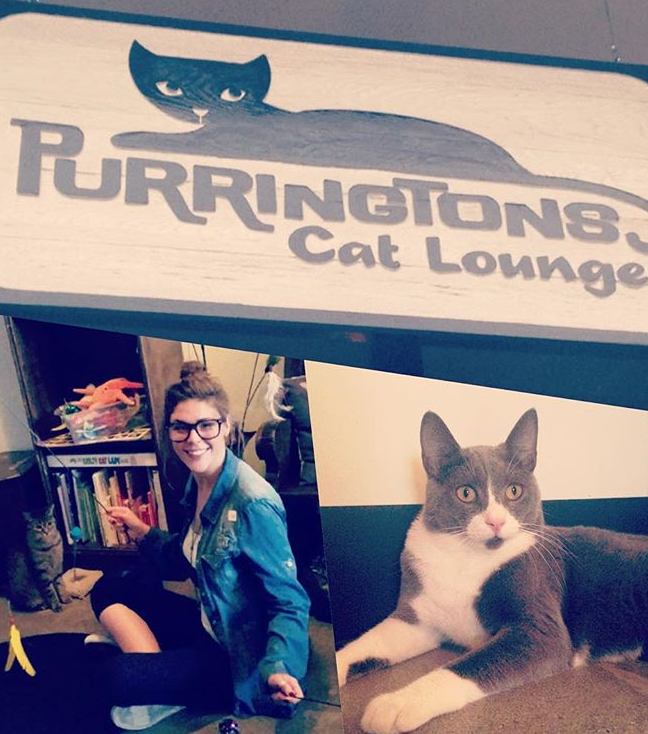 Purringtons is both a leader in the cat cafe world and the Portland community. They regularly host popular events to showcase cat celebrities such as MoShow the Cat Rapper and various experts on feline behavior and health. A true model for cat cafe success, Purringtons serves up a full menu of house-made food, local beer, wine, and other beverages. 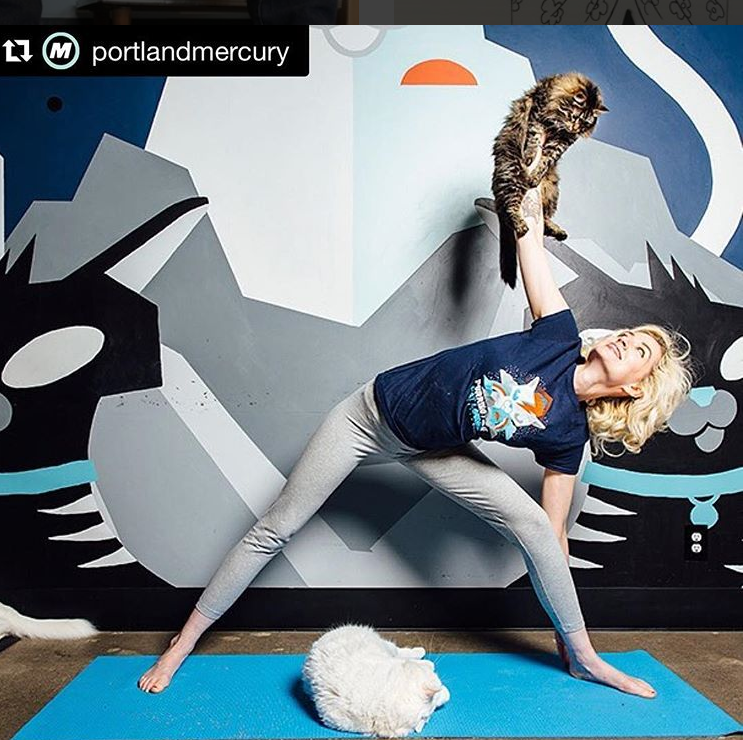 They have Weekly Purr Yoga (yoga with cats) and have lots creative cat themed events like Meowvie Nights, knitting with kittens, and wine tastings. The Coolest Small Business: Buy or Start? 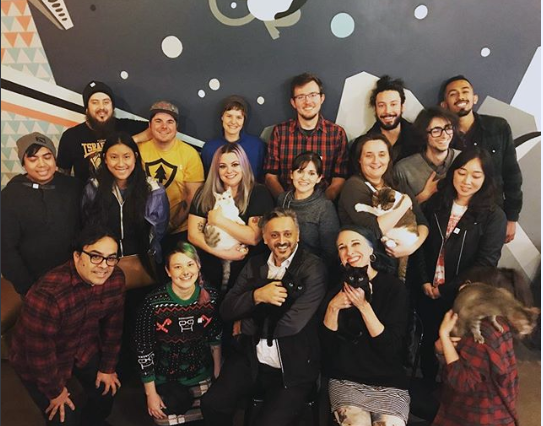 So we had you at cat cafe! You’re sold! But why not just open your own? Like all businesses, there is much more to opening and running a small business than the initial warm and fuzzy notion. Successfully navigating the first years of a small business can be daunting, with the Small Business Association reporting a failure rate of 20% in the first year and 30% in the second year for new small businesses. In the case of a cat cafe, add rolls of red tape to the usual challenges. Beyond the the 3 M’s of Money, Manpower, and Marketing, you have cats. Local zoning regulations have slowed or halted many a wanna be entrepreneur wishing to serve up a little refreshment in the company of cats. 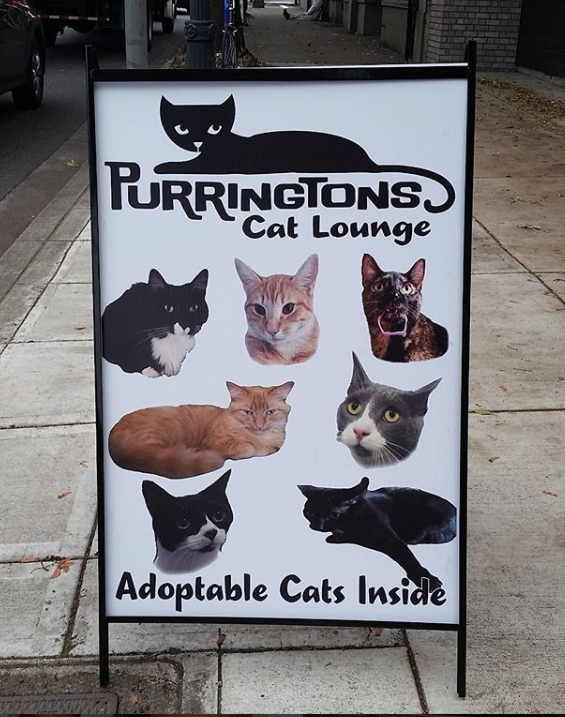 But the Purringtons team has not only navigated the often byzantine code hurdles, they secured the highly desirable license to serve adult beverages. 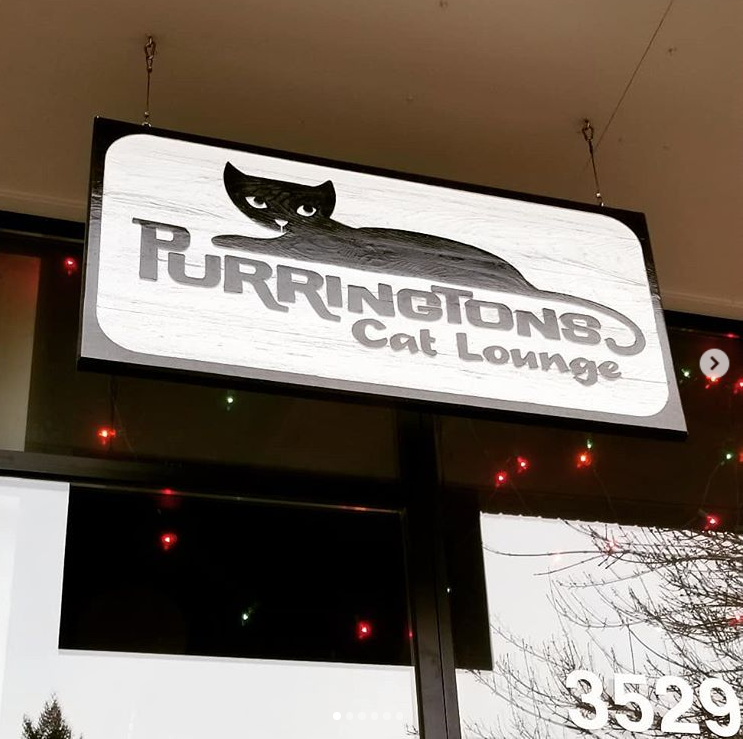 Purringtons not only has a loyal local following, but they have built a significant online presence with nearly thirty five thousand followers on social media. 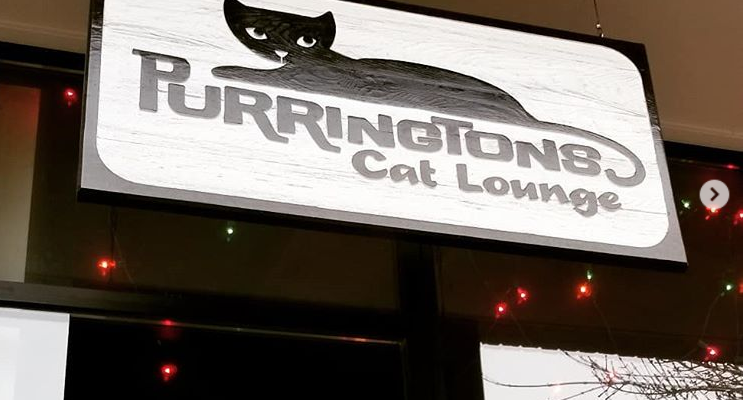 Sadly, Purringtons Cat Lounge closed their doors on December 1st, 2018. But the owners leave us optimistic that the cafe may open under new ownership. The Purringtons website and social media accounts remain active and continue to hint that new ownership and re-opening may be in the cards. So you still have a shot! Don’t worry: all the Purringtons cats are now in their furrever homes! In fact, there are six hundred and twenty five Purringtons alumni, many of whom stay in touch on Instagram via the hashtag #Purringtonsalumni. 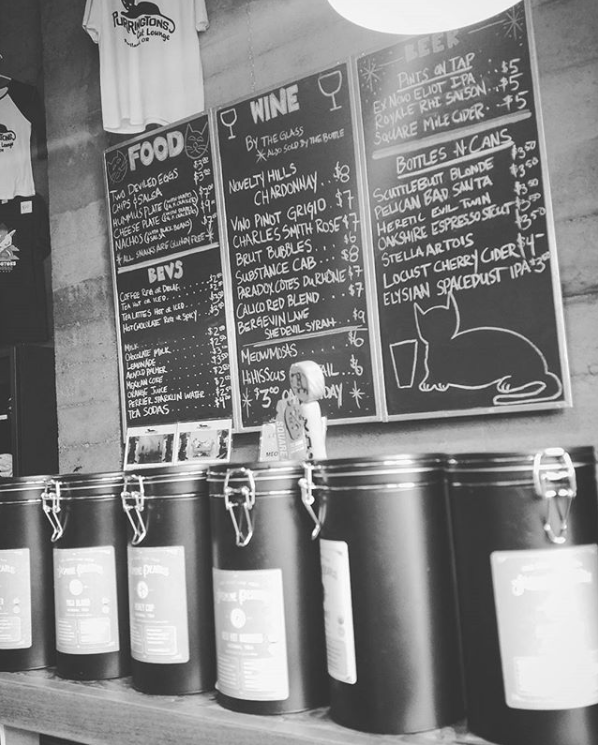 We’re pretty sure the enthusiastic Portland cat community won’t be without a cat cafe for long. Stay tuned! I love this concept as it helps so much with the adoption of cats and am praying they will open again as it is such a life saver plus what can be better than drinking a coffee with lots of cats all around.